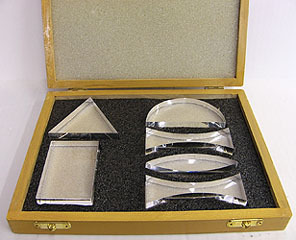 Made from the same high refractive index acrylic as eyeglass lenses are, this 6 piece prism set is ideal for performing refraction experiments and to study the behavior of light after passing through different shapes. Each prism is 15mm thick, and polished on all sides for perfect optical clarity. They are coated with a scratch resistant coating, similar to that used in modern eyeglass lenses. Each Prism has a specific place in the die-cut foam for easy storage.